The Newport 340 rod clamp is the predecessor to the 340C rod clamp. It has steel clamp knobs instead of plastic and fits all 1.5" rods without racks, such as the Newport 40 and Newport 45, as well as Thorlabs, OptoSigma and others. Made of black anodized aluminum, the Newport 340 is machined with 3 lands inside the rod clamp, assuring that it rides and clamps on the rod -always maintaining a parallel postion. 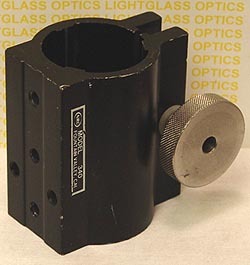 The front face is drilled and tapped to receive other optomechanical assemblies, like a Newport 34 rotating platform or a Cylindrical Laser Mount.